After taking a bite of one of Marni’s coconut covered donuts, I too felt like baking, but opted to go the savory route. While we have similar taste buds, Marni definitely has a bigger sweet tooth than me. This started at an early age when for breakfast, she always opted for chocolate chip pancakes while I opted for cheesy eggs and sausage. While I usually stayed away from chocolate, she was a chocoholic. Even now for an afternoon snack, Marni turns to biscotti and a chai latte while I turn to salty pretzels and unsweetened iced tea. Craving a warm, buttery, airy treat, popovers popped into my brain. 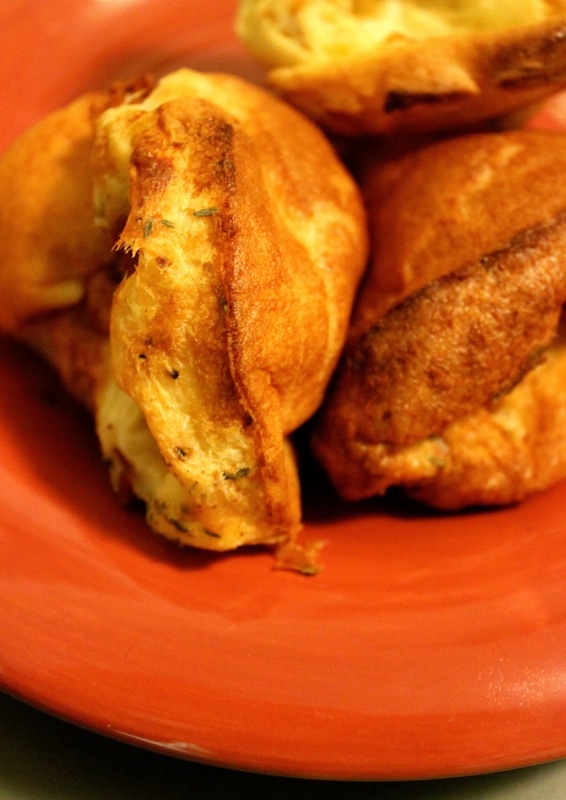 We first debuted our basic popover recipe last February in our Happy Groundhog Day post. This time, I decided to enhance the fun irregular-shaped rolls with the addition of melty Fontina cheese and salty pancetta. These Italian-inspired puffs are the perfect accompaniment to any holiday brunch or dinner. Preheat oven to 425 degrees Fahrenheit. Grease a popover pan generously with butter and place in the oven for 2 minutes. 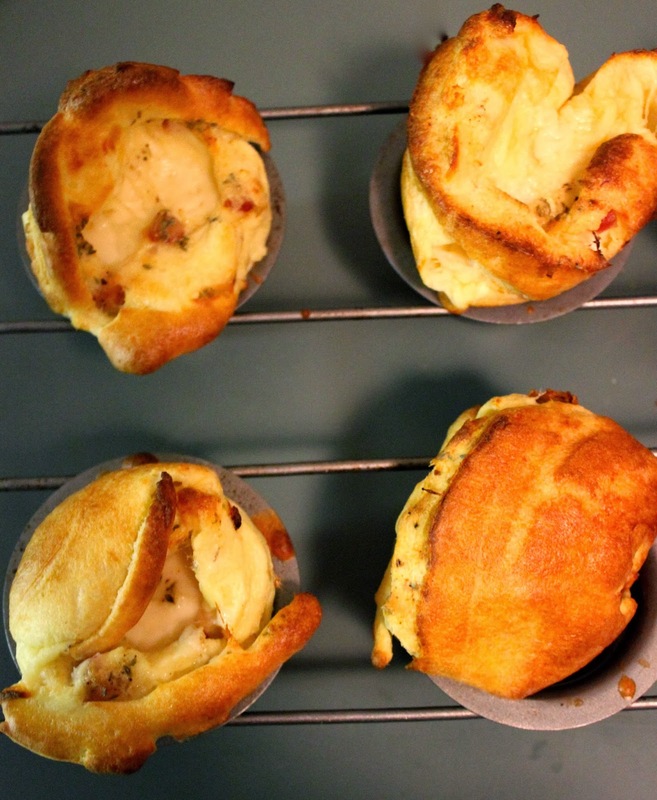 If you do not have a popover pan, a muffin tin is a nice alternative. While the oven heats, cook the pancetta in a small pan on medium high until crispy. Remove the bits with a wooden spoon and let drain on a paper towel. While the pancetta cools, whisk together the remaining ingredients to form a thin, runny batter. 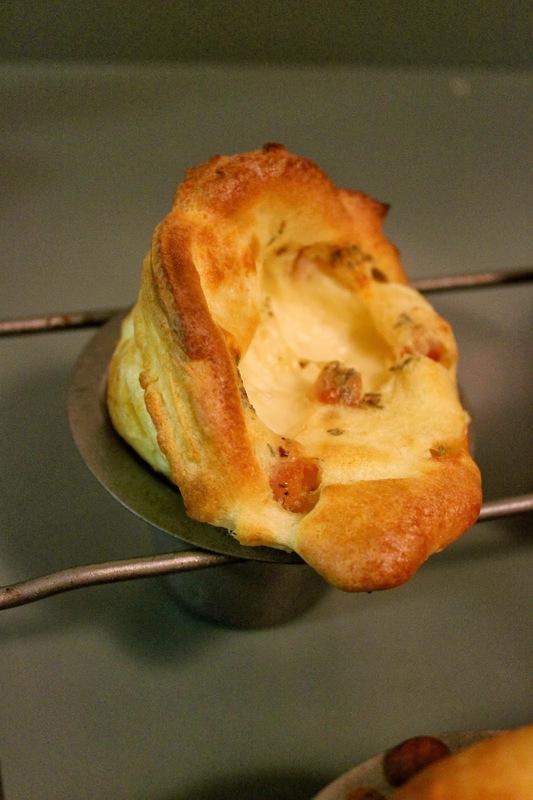 With a pitcher or measuring cup, pour the batter into the hot popover tins, a little more than 3/4 full. The pan will sizzle, don’t worry! After you fill the tins, drop 4 pieces of pancetta and 3 cubes of Fontina into each individual tin. Sprinkle with thyme and cracked black pepper. Bake the popovers in the oven for 25 minutes until fluffy and golden brown. Do not peak during baking! Will make 5-6, depending on the size of your tin. This recipe can also appeal to sweet lovers by throwing in dark chocolate or adding a citrus flare with orange zest! Just in time for Thanksgiving. . . .